People who are allergic to one type of nut have a higher chance of being allergic to another type of nut. So, if your child has symptoms of allergy for one nut, it is recommended that they get tested for other nut allergies. Siblings of nut-allergic kids also have a higher chance of being nut-allergic and should be tested too. If you are unsure about a food’s ingredients, stay away, just in case. Especially in the case of a nut allergy, it’s better to be safe than sorry. One study by Johns Hopkins Children’s Center showed that washing hands with warm soapy water safely removes peanut allergies. So, be sure to wash your hands after handling peanuts before preparing food for or touching your peanut-allergic child. Most household cleaners will remove peanut residue from kitchen surfaces, so be sure to keep a very clean kitchen to reduce the risk of cross-contamination in your home. If you are breastfeeding an infant that is high risk for a nut allergy, some data suggests avoiding eating nuts while nursing. Discuss this with your physician. If your child must avoid nuts altogether, make sure that they are still getting the nutrients that nuts would have provided in their diet. Make sure that their diet has plenty of healthy fats, fiber, and antioxidants, such as vitamin E, and rich in plant foods as they contain flavonoids, and phytosterols. As with any food allergy, focus on what foods your child CAN have and fill your home with lots of good alternative foods for meals and snacks. You want to create an environment that focuses on choices not deprivation. 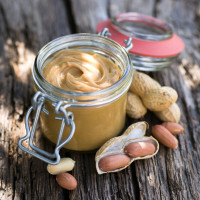 Have the whole family enjoy the same foods during mealtime so that your nut-allergic child does not feel singled out. « So Good for you Fungus!